Four attackers have 10 seconds to shoot, they can't dribble or move until a shot is taken, then they can rebound. The three defenders must box out three attackers (it doesn't matter if the open attacker gets a rebound), and make 3 stops to get out. Mike Fratello - attackers must make at least four passes before shooting, there should only be one open offensive rebounder, can optionally allow attackers to dribble after four passes (defend penetration). Tubby Smith - defenders have to contest every shot and make two stops in a row to get out (a stop doesn't count if the shot was uncontested), don't have two on the ball (talk), attackers are stationary, take the first good shot, but 4 passes maximum. Tom Izzo - 4 on 3 or 5 on 4 disadvantage, perimeter attackers can't move or dribble, weakside defender guards two. 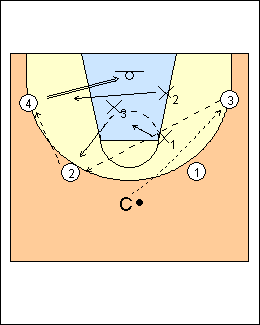 Larry Shyatt - attackers play for the first open 3 or shot, one defender is guarding two attackers and yells "I got two", this is a man or zone defence drill. Doug Porter - play to 6 points, the offence can shoot only from behind the three-point line (the shooter rotates to the top of the key as safety) and gets 1 point for every make, the defence gets 2 points for a stop and rebound. Ben Jacobson - Butler drill - 18 seconds on the shot clock, from 18 to 12 seconds offence can't score, live at 12 seconds, a 4th defender at halfcourt flies in. See Scrimmage - 4 on 3, Rebounding - Illinois 4 on 3.